It's been over a year now that Becca of Sew Me A Song has sponsored Quilty Habit. I can't thank her enough for her support! I feel very strongly about supporting small fabric businesses and local quilt shops, and I'm proud to partner with her. Becca is offering up a special fat quarter bundle of fabrics picked by me! I chose an assortment of white, gray, purple, and coral prints that remind me of dusk in the summertime. There are some great prints in there - text fabrics, two Carolyn Friedlander prints (the one that looks almost solid white is Rings in White from Doe), and a couple Japanese fabrics. I hope you are just as inspired to create with these as I am. The bundle is for sale in the shop, too, so you can purchase if you wish! If you win the giveaway, Becca will refund you for the bundle. 1. Leave one comment answering this question: If you could choose one fabric to back every quilt for the rest of your life, what would it be? (Linking to the fabric is optional, but I'm sure we'd all like to indulge in staring at beautiful fabric!). My favorite all-time fabric is the Summer Totem in Grapefruit print from LouLouthi by Anna Maria Horner. SO GOOD. I have about half a yard left and I'm saving it for something special. 2. Giveaway ends Saturday, July 11 at 9 pm EST. 3. Winner will be chosen with the Random Number Generator and emailed. 4. Anyone in the world who loves fabric can enter (if you don't love fabric, why are you reading this post, anyway? ;) ). 5. If you don't have an email address linked with your account when you comment, just make sure you leave one so that I can contact you if you win. Good luck! Thanks again to Becca! Hmmm..thats a hard question, I think any color of polka dots! I would choose the IKEA numbers or letters. Or anything by Carolyn Friedlander! That was a hard question...but is worth pondering over for the chance to win such a beautiful bundle! Happy 4th! Carolyn Friedlander wide screen crosshatch in Grey. I couldn't do one fabric for all my quilts, I would get too bored. Maybe a real pale yellow solid. Black and white text prints would be my choice! I think I would cry if I only had 1!! But let's go with cotton & steel Dottie fabric... I think I could make that go with just about anything! I could use any black and white text print or the crosshatch in grey. I usually make a scrappy back, though. I am another fan of Carolyn Friedlander wide screen crosshatch in Grey. I would use Minkee. It is so soft and so wonderful to feel. I love it. Any neutral colored fabric would be good. I love the fabric bundle and the colors. and another fan of the Carolyn Friendlander wide screen crosshatch, I love all the colours in that particular range but if I had to choose one then it would be the Grey. Love your fabric bundle, some very nice fabrics in it. What a great, but tricky question! I'm going with Briar Rose Froggie Pond. I started to use flannels for backing my quilts. It is just so soft to snuggle up in them! I like neutral colors or a very small print for backing quilts. That's quite the question! I like Writing from the Gentlemens Club, but any of the newsprinty fabrics catch my eye. What a sweet shop, and from Maine, too! I'll surely revisit! I don't recall the manufacturer but the fabric design/name was Pure Velvet. It was all shades of purple in flower prints--lilacs were my primary favorite. I've used it in several quilts as I believe all quilts need at least a touch of purple. So if it were still available this would be the one for me! I would have to say yellow solid. It just makes me happy and its a cheery color and pretty much goes with everything. 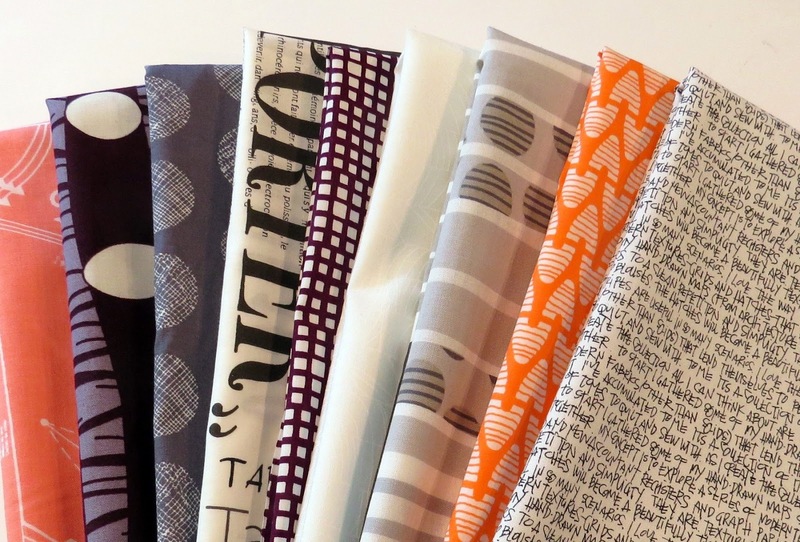 Carolyn Friedlander's Crosshatch fabric; if can only choose one of them: Grey. I love your fabric choice; thanks for the give-away. Matching be darned, I would choose the raindrops/poppies print from Anna Maria Horner's field study line, in either pewter or turquoise. I love Toile Bouquet. It is 104" wide and I got it from Connecting Threads. It is a beautiful blue on white print, the style matches pretty much everything I make. These are beautiful fabrics! My favorite qUilt backing is sheets from thrift stores and garage sales. I'm with the grey crosshatch people! I think I'd have to pick a blue solid from American Made Brand. I love blue, and AMB is my go-to solid fabric. It frays less than other solid brands and has a great hand feel and vivid color. No, I don't work for AMB; I'm just a big fan! You are making me think and it's way too hard to decide which fabric for backings, although I love what you chose. In reality I think a black and white or gray print such as letters or fine lines on the fabric would be my choice for every quilt. While all this time I'm screaming out "anything orange" would work! Yes anything orange. What a hard question! lol Think it really is the Quilt top that "tells" me what backing it "wants"! giggle But if I could only choose one Forever (Arrrrgh! )...I think the grey hatches sounds good...really have no idea on what to use...would have to be pretty neutral tho..to match any top I made. I don't think I could just pick one but I like text prints, minky and neutral colors for backings. I like the back to be as interesting and fun as the front! Only one fabric?Hard question.I can´t pick only one.All my quilts have differents backings and love to see the quilting because I hanquilting , so if It has to be only one would be a green fabric ,my best fav color. Difficult question. I think I could use Marjorie 104 from Connecting Threads - ivory background with greys & creamy yellows - makes a nice neutral fabric that would go with most quilt. Thanks. Riley Blake Rocket Age Rocket Blast in Navy. I love that print!!! :) Congratulations on such a great partnership, Jess. We all need more math in our lives! Hi! Thank you for a lovely give away! I love words and would happily back all my quilts with letters! My favorite backing to use is a black and white from Hobby Lobby that is all cats! So cute! Thamks for the wonderful giveaway! This was so hard, just to pick ONE!! but I decided that Roman Glass Purple is one of my favorites. I love all the deep colors this fabric has. I don't think I'll run out any time soon because every time I see it I buy some.!! Tough question. I think anything with flannel that is soft and snuggly. Lately I am a Kona Solids fan. I like Sweet Pea right now. Britten Nummer from Ikea is my favorite for the time being. I love the text print! Wow tricky question!! I think if it was FOREVER, then I would back it with white flannel so they would be soft forever!!! And also so the quilting stitches would be visible and then double-sided!!! This bundle of fabrics is gorgeous! I love it! Hm, if I had to choose one fabric it would be Britten Nummer from IKEA and I would spice it up with a strip made of the fabrics I used for the front. Thank you for this giveaway. That is a hard question to answer! I would have to say Crosshatched in Gray, but dots would be great, too. Your bundle is pretty and I love the colors. Oh so tuff. I think cotton and steel mosh rabbits. It's cute but sophisticated. I love Mochi Linen Dots...in every color. Would happily use over and over. Thanks for a great giveaway! Britten Nummer - the Ikea fabric that has been discontinued. I bought the few yards that were left in the store but it certainly won't last me the rest of my life! I love Heather Ross's Lightning Bugs Goldfish in Bags (I'm not sure if that is even the correct name). I'm a newer quilter so this fabric is "before my time" (and I don't own any of it!) but it just makes me smile. It would add whimsey to any quilt. Many thanks for sharing with us! I would go old school and back all my quilts with muslin or Kona Snow. HELLO, I'd select a small gray+white floral! i would pick a small text print in a color that would go with my top. I would pick any black and white fabric. I would have to go with a neutral grunge. I really like Cat Dreams by Lizzy House. It is so cute. Honestly, just give me a good polka dot and I'm good - no color preference! Good question, Jess! I wouldn't have thought to pair purple and peach but it works. I don't have a favorite backing.....I just try to blend a pattern to the front somehow. its neutral enough for any project and usually i have enough left fir mall proects and or just stash! Jess, Forever and ever, I love "Sunburst" In Vintage by Jennifer Sampou for Robert Kaufman, from her Shimmer 2014 collection. I'd wear it too: Shirts, dresses. Thank you. HR goldfish in bags. I love that print. I think I'll be the odd one here because I just love a quilt with a minkee backing. Makes any quilt so hugable and cuddly, of course it's not for those heirloom quilts with the polyester in the minkee. I would also have to go with a neutral Grunge...only one fabric would definitely cramp my style! I love a "surprise" backing and have a need for it to somewhat coordinate with the front...thanks for the wonderful giveaway and a reminder that we are lucky to have choices in backing fabric! I would have to go with Anna Maria Horner too - probably Folk Song, Coloring Garden in dusk. My all time favorite backing fabric would have to be a Moda Paisley. I just love all the swirls. 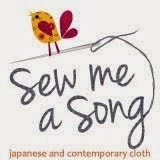 I love Sew Me A Song! I wish I could spend more money there! I doubt I could stick with just one, but I really love Tula Pink's Turtle Bay and it comes the closest. One fabric for ever and ever? Tough one! Today I choose Tula Pink bats in the belfry in blue - ask tomorrow though and who knows? Very difficult question. I am actually in love with a Connecting Threads fabric called shimmer. If not that, just a solid fabric would do. Thanks for the chance. I like scrappy backs so I don't think I can choose just one fabric choice. I'm loving Crosshatch right now. I love this fabric, from Tahiti: http://quilting.over-blog.com/article-tissu-tapa-tapa-fabric-116958509.html just love it! I'm another crosshatch lover! It's what came to mind before I'd even read any comments! I love that you can get it in wide backing fabric, saves piecing!! Great question! It's a tie for me - Archetextures ledger print or the black and white asterisks from Comma. I have both hoarded and they're just waiting for the perfect top! something soft and cuddly! I don't know which fabric though! Maybe Heather Ross's Nanny Bee in Coral? For me it would be Social Climber in Ice from Garden Party by Anna Maria Horner, it is such a beautiful pale blue with gorgeous yellow roses. I love the version that was released in Hand Drawn Garden but there is something about the original version that has me smitten. (https://www.etsy.com/listing/103649247/anna-maria-horner-garden-party-social) Thanks for asking such a fun question and thanks to Sew Me a Song for the giveaway! C&S all the states fabric...especially love the navy! I actually lean the other way. I love simple backs for mine, more like the wide Doe hatches. I love the simple lines! Only One Fabric? Forever? Well... It would be black and white text because I think that would go well with any binding!! Thanks for the chance!! Tough. Guess I would go with a text print in black and white. It would have to be an allover print to hide mistakes in quilting, maybe black and white text or black dots on white. I don't know if I could pick one thing for everyone. My grandmother always uses a solid in this really fuzzy warm fabric. I might go that direction, but think it is fun to leave it open to fit the needs of the quilt. Hmm, I think I'd pick Sketch in medium gray - goes with pretty much anything! I love art gallery fabrics and Recollection Carnation Bullion Fronds Katarina Roccella is a favorite of mine! thanks! I love text fabrics for backs! I have had fabric from SEw me a Song...super fast service and I love her selection! My favorite backing is Woodgrain in Vintage Yellow - kind of generic so it can be used with just about any kind of quilt top. Thanks! I don't know about a single print but if I could I'd back everything in Liberty. I love your bundle. Thanks for the chance to win! Thank you for your giveaway. For a backing I would choose one of the vibrant floral prints from the Honey Honey line by Kate Spain. They have been some of my favorites for years!! It would be so hard to choose one! Each quilt calls for something different. I really like Carolyn Friedlander's metallic modern floral in teal. I could find a home for it in several of my quilts. I don't have any but I think some of Alison Glass's Ex Libris prints would be amazing backings! Wow! Great giveaway. Thanks! I haven't made many quilts and am still trying to build a stash, but I've really loved some of the Cotton & Steel basics - mostly the XOXO fabrics. I'd be using black and white in script of some kind. Here is one sample of Ampersand, along with a few others in that collection. Carolyn Friedlander's Widescreen in grey would be a good one that would go with anything. Pearl Braclets by Lizzy House. I couldn't pick a color, but I love these prints and they are perfect for backing. If I could choose any fabric to back a quilt, it would depend on the quilt. My quilts are pretty much country.traditional so I end up using a tan. I KNOW BORING, HUH? I will try to do better. A hard question but I really like a soft solid for my backing and something in a neutral color by Robert Kaufman is nice. That way you can make the front from just about anything! If I had to choose just one fabric, it would be a simple minky in cream. Who doesn't like minky? I did find a fabric in the Sew Me A Song shop that I'd pick...and that would be Sunburst Stripe in Pewter by Dear Stella. I think pewter would go with any color too. That's a HARD question! LOL! Hmmmmmm......well, I love color, so I'd probably pick one of the "staple" type prints from Ann Kelle. Thanks for the chance! I think I would pick a neutral color with a small print. I would choose something from April Rhodes Arizona collection. Love these colours and prints! That question is SO hard to answer! My daughter would say 'any print from the Summersville range'. I love grey and white modern prints (like Windham / Lotta Jansdotter / Echo), as well as polka dots. 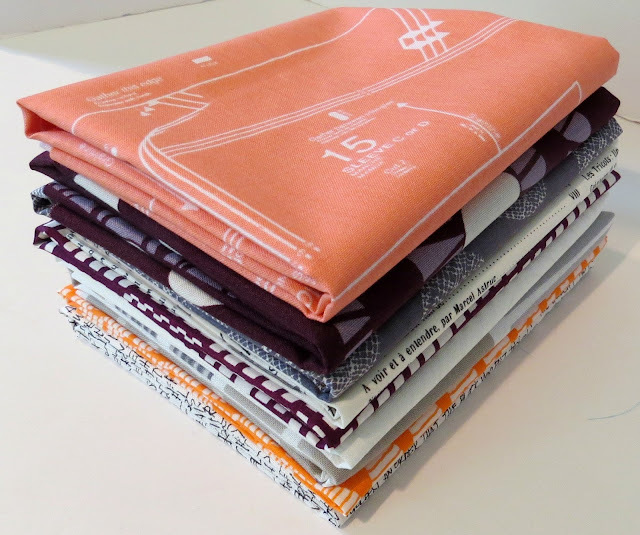 Though I actually think I'd be happy to back every quilt with the orange fabric on top of the stack in your last photo!! I like pieced backs that make 'double-sided quilts' but if going with an allover back I'd choose something with some interest like polka dots or crosshatch, a bit more 'oomph' than a solid without being too busy. I think I'd choose a neutral tone on tone, or pale gray on white or cream, maybe something in the Pearl Bracelets line. Right now, I think I'd choose the Cotton + Steel basics Sprinkle...not sure I can commit to a color though. Thanks for the giveaway! I love all of Lotta Jansdotter's fabrics, but if I had to pick just one, Mormor. I love the "I am a Maker" low volume fabric. What a great backing fabric that would be. You'd have to read the texts, which say things like: I make stuff, handmade, Just keep making, etc. Perfect! Only one fabric, that would have to be fairly neutral eith a subtle print. I like to make quilts in different styles and it eould have to fit them all. I would love a wide print so no piecing! Maybe something texty and neutral would be a favourite backing to use all the time. I would love to win this bundle. Love the colours and" sew me "a song is a favourite shop of mine ;-) Thanks for the chance .